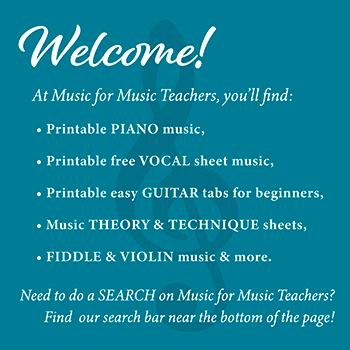 Beginner Keyboard Music Sheets: Download Free The Water is Wide for Piano! Beginner keyboard music sheets as beautiful as The Water is Wide will win your piano students over with storybook lyrics and a lovely melody. Download this free sheet music to print out, three different versions! Students enjoy easy sightreading music, pieces with which they are almost instantly successful, especially when they are as pretty as The Water is Wide. But I don't use beginner keyboard music sheets like this song merely for sightreading or supplemental purposes. I encourage students to play chords with both hands, starting simply, with perhaps one chord per measure, then two chords, and eventually (maybe even the first week) broken chords. See the examples below. One of the things I love about this song is that it uses (in this arrangement) every one of the 6 chords that belong in the key of C.
C, Dm, Em, F, G, Am...they are all here. What good practice for budding pianists! The Gsus (G suspended) chord in these beginner keyboard music sheets is usually something new for them. I explain that a suspension is when the middle note of the chord is "hidden" for a few beats in such a way that we wait expectantly (musically speaking) to hear what it will be. The suspended chord creates a feeling of waiting, waiting... until finally we hear the note we have been longing for -- the resolution into the regular, usual chord. It's so pretty! Essentially, the "b" in the middle of the G chord is replaced by a "c."
Then we lose the "c" at the beginning of the next measure with the resolution into the "b" note. It has the feeling of a sigh, released. I have suggested a G7 chord in a couple of places in one or two of the beginner keyboard music sheets, but a plain G chord is just fine. Here is an easy-counting version, for younger students who are flustered by the eighth notes. One thing to watch out for when teaching the melody: the quarter rests are almost invisible to the typical student eye, and many students will look right past them! "There are 8 rests hiding in this song. Can you find them?" "One-two-three-four, REST! The wa-ter is wide, two-three-four, REST! I can-not get o'er, two-three-four, REST!" You get the idea. I have found this to be very effective in this song. I own two great folk song books that include this song, except the name given in the books is "O Waly, Waly." Both books, Folk Songs of England, Ireland, Scotland & Wales, and One Hundred English Folksongs, have 8 verses of lyrics, of which 3 verses are almost identical to the lyrics I have used here. I also have lead sheets of The Water is Wide in several keys (more suitable for singing than the key of C for this song) that you can play on piano or guitar. Enjoy this song! I'll bet your students will.